We've got a fascinating pile of tech news for you to work through today, covering products existing and upcoming – from changes making Google Assistant smarter, to an upgrade Apple might be planning for the 2018 iPhones, all courtesy of our friends at TechRadar. What will the Note 8 successor look like? 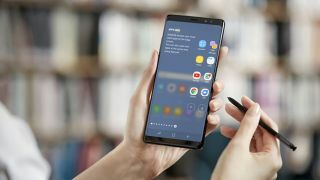 With a launch date of the 9th of August confirmed, we're continuing to get a steady stream of leaks on the next Samsung flagship, the Galaxy Note 9. The super-sized phone is going to come with a revamped and distinctly yellow S Pen, according to the newest rumours, which would be a bold design choice – we should find out for sure in a few weeks' time. Google Assistant is getting more proactive, Google has announced. The digital AI tool will now dig into your calendar and Gmail to give you an at-a-glance overview of your day before you've even asked for it, and is also going to give more contextual options for dealing with what's currently on screen. The update is arriving now on Android and iOS. Considering Apple's iPhone has led the way in smartphone technology over recent years, it's surprising that the handset only added fast-charging tech last year – though a separate accessory was needed. With the 2018 phones, Apple is going to go one step further and bundle a fast charger in the box, according to one of the more respected rumour sites. Samsung isn't just launching new phones this year, according to the rumour mill – it's also got plans to unveil the Galaxy Watch, aka the Galaxy Gear S4. The latest tidbit of information to reach us suggests the new smartwatch is going to turn up at the same time as the Galaxy Note 9: so keep your eyes on the event scheduled for the 9th of August. Connecting a VR headset to a PC gives you some great graphics quality, but it also means you're tethered by some pretty weighty cables. Now the biggest players in the industry (including Oculus and Valve) have come together to set up a standard specification called VirtualLink, which packs all the data and graphics necessary into one slim USB-C cable.